The annual canvass of registered voters’ addresses has begun. This is a yearly audit of registered voters’ addresses to confirm whether or not they are correct. The canvass affects all voters who are inactive, and voters who are active but have entered a change of address through the post office based on information from the Secretary of State through the National Change of Address Center. Make sure you mail the Address Confirmation Card back to the Registrar of Voters office. The address is incorrect and you have moved to a new address within Caddo Parish. The address is incorrect and you have moved to a different parish or out of state. The address is correct and you still live at that address. The person on the card does not live at that address anymore. The person on the card is deceased. Please enter the address where you receive Homestead Exemption, if you receive it at all. If you live in an apartment or a rental and do not have a Homestead Exemption, you still need to enter your address in the top area. 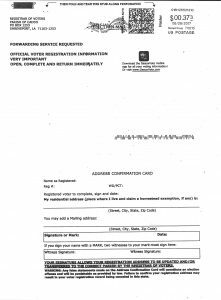 The section marked “The address where I receive my mail, if different, is:” is ONLY for a P.O. Box or if you are receiving your mail at an address other than where you live. Please make sure you sign the card at the bottom. If you do not send the card back, we cannot make changes and you may not realize that the Post Office has changed your address. 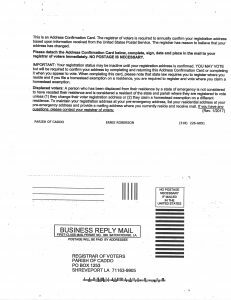 You will be issued a new voter ID card from the state, which may affect your precinct and where you go to vote, causing you a delay at the polls because you will have to fill out a Change of Address form at the polls.